A sneak peek at the secretive initial candidate to replace the Soyuz rocket as launcher of humans into space. When the Angara family of rockets was originally proposed in the 1990s, it was advertised purely as a launcher of unmanned military and commercial satellites, which, at the time, relied on Proton vehicles. However, as the project finally started moving forward in the second half of 2000s, its scope widened to include possible manned missions as well. 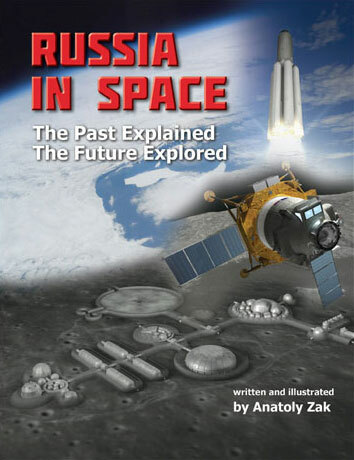 After entertaining the ideas of launching a 12-13-ton three-seat piloted spacecraft on the Angara-3-based rocket (alternatively known as A3M, 3P or 3.2), engineers switched to the more powerful Angara-5 version around the summer of 2007. Simultaneously, the operational pressure and the thrust of the rocket's RD-191 engines was to be reduced to a more explosion-proof level to increase the safety for the crew. Moreover, a manned ship with an estimated mass of around 20.8 tons carrying a crew from four to six people could now be inserted into the low Earth orbit. In 2008, GKNPTs Khrunichev, the Moscow-based developer of the Angara family, unveiled a scale model of a three-stage, 712-ton booster designated Angara-5P, where "P" stood for "piloted" or "manned." Somewhat surprisingly, the company said at the time that the vehicle would be based at the near-polar circle launch site in Plesetsk, which had never hosted manned missions. Moreover, the paperwork also claimed that rocket could carry piloted and cargo ships to escape Earth orbit on their way to deep space. The Angara's role as a carrier of manned spacecraft finally become official, after funding woes had killed the development of the competing Rus-M rocket in 2011. By that time, the Russian government had already launched the construction of a new cosmodrome in the Russian Far East and the Angara-5 rocket was promised a launch pad there. Under Roskosmos' tender announced in July 2012 under code name Amur (after the great Siberian river), the Angara-5 rocket would be customized to fly from Vostochny, carrying the 20-ton new-generation PTK NP spacecraft into the low Earth orbit. The first phase in the development of the Amur project would run until the end of May 2013, Roskosmos said. Given the fact, that any deep-space exploration missions might not take place until the 2030s, Angara-5P could be the main carrier of Russian manned spacecraft during most of the 2020s. 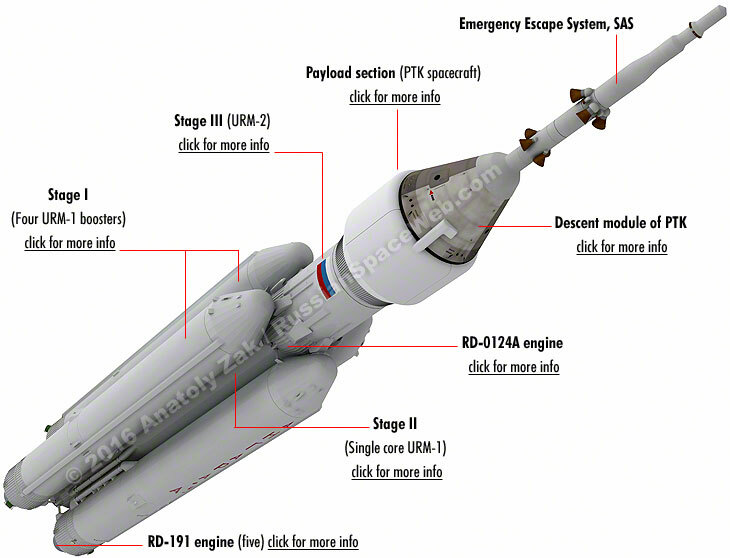 Moreover, GKNPTs Khrunichev proposed deep-space mission scenarios, where the manned vehicles would still be launched on Angara-5P and dock in low Earth orbit with large space tugs delivered by super-heavy rockets. In the meantime, the design of the Angara-5P rocket went through a number of incarnations as evidenced by scale models appearing at various shows. By 2011, the rocket had "lost" its upper stage, which had previously been mounted on top of a five-booster cluster, emulating the design of a basic unmanned Angara-5. Instead, on the manned version, the central core booster with 127.5 tons of propellant would now act as the second stage, after the four first-stage boosters had exhausted their total of 510.6 tons of propellant. RD-191 engines for the Angara-5P would be upgraded with movable nozzle extensions to improve their performance at high altitude. According to known specifications of the two-stage Angara rocket, its spent strap-on boosters would impact the ground 1,300 kilometers from the launch site. The payload fairing would be dropped 1,440 kilometers downrange. Apparently, in an effort to "man-rate" the two-stage Angara, Khrunichev considered throttling down RD-191 engines to a lower but safer thrust of 185 tons. As a result, just five engines with single combustion chambers would be required to deliver at least 18 tons of payload into orbit! For comparison, the Soyuz rockets launching 7-ton spacecraft use six four-chamber engines with a total of 24 combustion chambers! 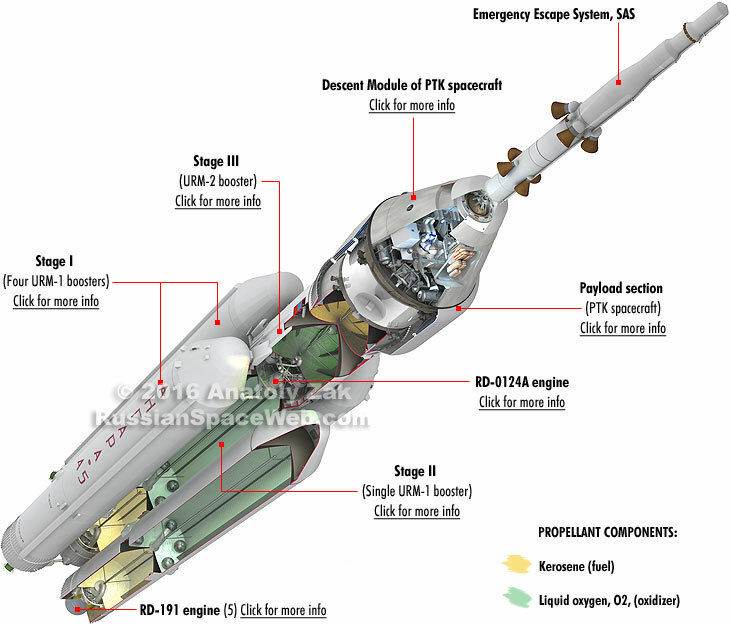 However in its annual report in 2015, NPO Energomash reported that Angara-5P would be equipped with the RD-191M engine, whose thrust will be increased by 10 percent thanks to an enlargement of its nozzle. The Angara-5P rocket would still have the ability to lift off and fly to a safe distance from its launch facility even if one of its five engines failed during launch. Launched by a two-stage Angara, the manned spacecraft would probably use its own engines to enter an initial parking orbit and then maneuver itself to a space station, to rendezvous with a space tug or to conduct an autonomous orbital flight. On Dec. 26, 2015, Roskosmos awarded a contract to GKNPTs Khrunichev to develop the Angara-A5P (Angara-5P) rocket within the Amur project. The 32,398,611,000-ruble ($425.6 million) contract covered work over the next 10 years, until Nov. 25, 2025. According to the contract, the production documentation for the launch vehicle would be developed by the end of 2018. It included blueprints for the full-scale electric and fueling prototype of the rocket known as NZh. The prototype was scheduled to be delivered to the launch site for tests in January 2021, followed by the first launch of the flight-worthy Angara-5P from its future launch pad in Vostochny beginning in the third or fourth quarter of 2021. The first rocket would be followed by two additional flight-worthy rockets scheduled for launch in the third or fourth quarters of 2022 and 2023, respectively. The contract would be concluded in 2024 and 2025 with the preparation of technical documentation for serial production of the rocket. The hefty price of the contract for the Angara-5P rocket attracted the attention of a government-approved watchdog group, ONF, which has the official goal of monitoring government spending for signs of waste and corruption. One ONF activist made the contract for the Angara-5P development the subject of an official complaint to the federal accounting agency, Schetnaya Palata. He alleged that the contract violated multiple federal laws, inflated prices and duplicated already completed work. 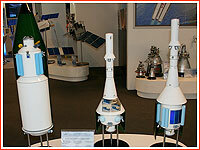 By 2017, the development of the Angara-5P rocket was essentially abandoned in favor of the Sunkar/Soyuz-5/Feniks concept, which would carry the PTK Federatsiya spacecraft.